Carrollton-Farmers Branch Independent School District general information and student achievement data at both district and campus levels are provided on this page. Also presented on this page are descriptions, pictures and maps of moderately priced Carrollton-Farmers Branch ISD homes that currently are for sale. Carrollton-Farmers Branch Independent School District operates twenty-four elementary schools, six middle schools and five high schools. These thirty-five schools are attended by approximately 25,200 students who live in Carrollton, Farmers Branch, Addison, Coppell, Dallas and Irving. Carrollton-Farmers Branch ISD's 2018 TEA STAAR component scaled score is 79. As is further explained in the Texas Education Agency 2018 Accountability Manual, the STAAR scaled score is calculated by first adding equal weightings of the percentage of assessments on which students’ performance mastered grade level, met grade level and approached grade level, dividing the sum by 3 and rounding it to the nearest whole percentage. This raw STAAR raw component score is then adjusted or “scaled” by using a conversion table to align accountability letter grades and scores of Texas public school districts and campuses. 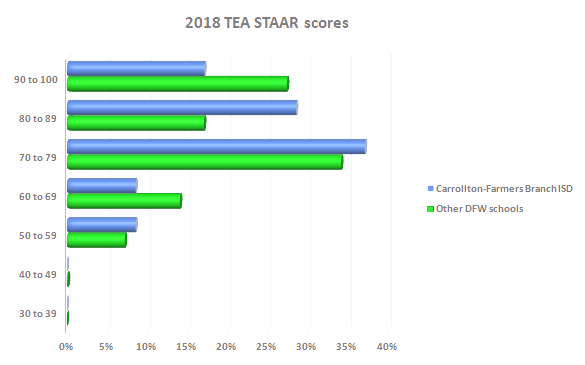 As depicted in the 2018 TEA STAARS scores graph (right) and shown in the Carrollton-Farmers Branch ISD schools table (below), six Carrollton-Farmers Branch ISD campuses attained TEA STAAR scaled scores between 90 and 100, ten campuses STAAR scores were between 80 and 89, thirteen had scores between 70 and 79, three scores between 60 and 69, and three Carrollton-Farmers Branch ISD campuses had STAAR scaled scores between 50 and 59. Students living in the north Dallas suburbs and north Dallas area profiled on this website attend eight Carrollton-Farmers Branch ISD schools. One of these campuses has a 2018 TEA STAAR scaled score between 90 and 100, one between 80 and 89, five between 70 and 79, and the STAAR scaled score of one campus is between 50 and 59. The 2018 accountability rating for all Carrollton-Farmers Branch ISD schools is Met Standard, the TEA's highest campus rating. Additional academic performance, student enrollment, teacher staffing and other information about these schools is available by clicking on the campus names. For information about other public schools attended by Coppell and north Dallas students, click on these Coppell schools and north Dallas schools links. Shown below is a typical website presentation of currently listed homes that are more or less in the middle of the Carrollton-Farmers Branch ISD single-family homes price range. A similar presentation of all currently listed Carrollton-Farmers Branch ISD single-family homes is available on this Carrollton-Farmers Branch ISD homes for sale page. Wood Laminate Floors Throughout, Ceramic Tile In Kitchen And Bathrooms. Updated Eat-in Kitchen With Granite Counter Tops, Marble Back Splash And Stainless Steel Appliances. Wbfp In Living Room. Beautiful House!! In Great Condition And Within Walking Distance Of The Elementary School. 3 Bedroom, 2 Baths. Relax On The Covered Back Porch. Close To Major Highways.